Qiagen and Natera are partnering to develop cell-free DNA assays focused on prenatal screening for Qiagen’s GeneReader NGS System, through a 10-year collaboration that could generate up-to-$50 million-plus for Natera. In interviews, executives from the companies said their partnership is designed to build on Natera’s expertise in reproductive genetics and non-invasive cell-free DNA testing, Qiagen’s growing next-generation sequencing (NGS) business, and the NGS-enabling offerings of both companies. Natera and Qiagen plan to create a complete “sample to Insight workflow with GeneReader, a scalable end-to-end platform, and validate the sample preparation workflow using Natera’s Constellation platform, which would be accessible in combination with the Qiagen Clinical Insights (QCI) bioinformatics solution to hospitals and laboratories that use assays developed through the collaboration. “We’ve got a very good NGS solution in the market, but we do believe that great content is ultimately going to help us differentiate and be successful. That is what really led us to Natera,” Jonathan Arnold, Qiagen VP, Head of Oncology and Precision Diagnostics, told ClinicalOMICs. 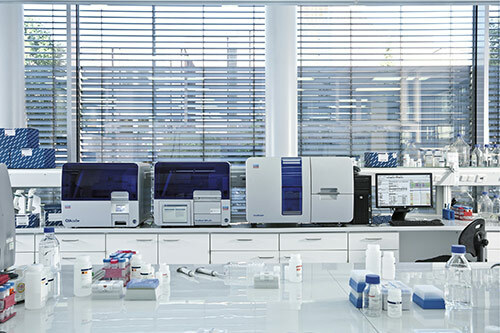 Qiagen has committed to exceeding $140 million in NGS sales this year, up nearly 22% from $115 million in 2017—just 8% of its total $1.418 billion in net sales last year. To expand in NGS, Arnold said, Qiagen reasons it must broaden its focus beyond oncology, and prenatal screening represents a multi-billion-dollar opportunity to attract customers by expanding test offerings. Research and Markets has projected the global prenatal testing market will expand at a compound annual growth rate of 28.85% between 2016 and 2022, when the market would reach more than $7.2 billion. Through their partnership, the companies plan to develop new NIPT assays that are intended to analyze non-invasive maternal blood samples, applying liquid biopsy technology. Building on Qiagen’s PAXgene blood cell-free DNA collection and sample processing technology, designed to be fully automated and integrated into the GeneReader NGS workflow, the tests are expected to selectively differentiate fetal placental DNA from the background of the mother’s DNA to test whether a baby is at higher risk for common genetic conditions. Each company will shoulder its own development costs for the assays. Qiagen has agreed to pay Natera $40 million in upfront licensing fees and prepaid royalties in the first quarter of this year, and $10 million in payments tied to achieving development, regulatory, and sales milestones—as well as ongoing royalty payments on sequencer and reagent kit sales. “We think the deal can be significantly more valuable than the $50 million that is under the current contract,” Natera COO Steve Chapman said. The San Carlos, CA, test developer finished last year with $210.9 million in revenue, down nearly 3% from 2016, reflecting one-time delays related to new prior authorization requirements, plus reduced average selling prices of tests due to Natera’s transition to in-network contracts with payers. In addition to the payments, other attractions of the deal for Natera, Chapman said, were its potential for tapping into Qiagen’s global reach and distribution—including its logistics, regulatory, sales and marketing capabilities—and its potential for expanding its base of hospital and lab customers for its NIPT tests through Constellation. The platform has enabled labs in more than 15 countries to implement next-generation clinical genomic testing through applications that include analysis of cell-free DNA, mixture fraction, and heterogeneous mixtures of DNA, including NIPT and NIPT paternity testing. Among labs using Constellation are LifeLabs in Canada; Genetica DNA Laboratories, a LabCorp brand, a leading genetic lab in Europe; and MedGenome in India, which enabled the launch of India’s first NIPT. And just as Qiagen is looking beyond oncology, Natera last year expanded beyond prenatal screening, launching the Signatera circulating tumor DNA assay in August. Signatera is a research-use-only test designed to analyze whole-exome sequencing data from a patient's tumor sample, using the data to create individual-specific assays that target 16 or more mutations known to be present in the tumor tissue. “While we didn’t include Signatera in the original deal with Qiagen, we may do so in the future,” added John Fesko, ‎Natera VP of Corporate and Business Development. Natera is a longtime customer of Qiagen services that include DNA extraction and library preparation. In addition to Signatera, Natera’s tests include the Horizon genetic-carrier screening test (HCS), Spectrum preimplantation genetic testing (PGD/PGS), Anora miscarriage testing, and NIPT solutions such as Panorama and Vistara. Vistara was launched in May 2017 and is designed to screen for new mutations in 30 genes that can cause severe conditions affecting the skeletal, cardiac, and neurological systems—conditions that often go undetected with routine prenatal screening. Panorama was launched in 2014 as the only NIPT that can distinguish between maternal and fetal DNA. In October, Panorama became validated to screen twin pregnancies for zygosity and chromosomal abnormalities, making it the first NIPT capable of determining whether twins are identical or fraternal as early as nine weeks' gestation. Natera’s test volume grew 15% last year, when it processed approximately 515,200 tests, compared with about 447,600 tests in 2016. The company recognized revenue on approximately 268,800 tests, of which the largest portion or 196,100 tests were related to Panorama—versus 220,400 tests in 2016, of which 180,800 tests were related to Panorama.